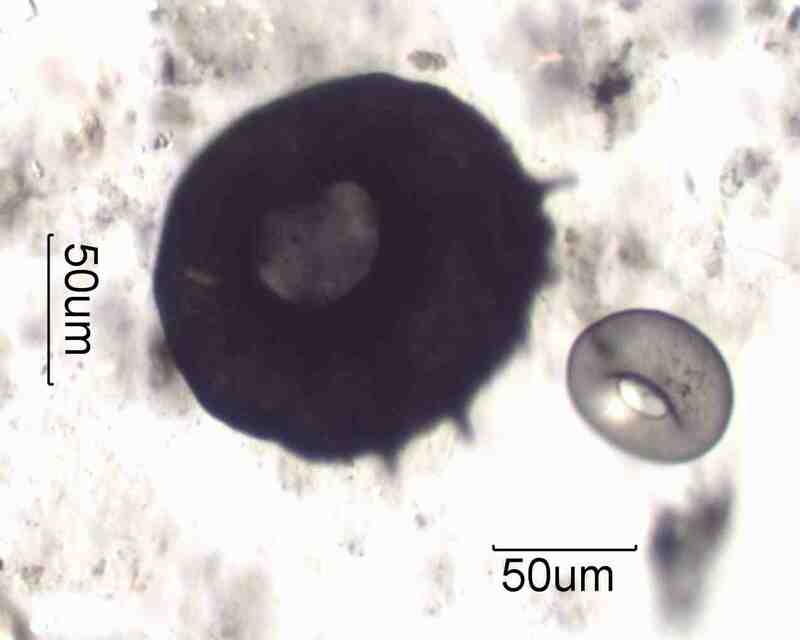 This shows both Centropyxis aculeata and Arcella vulgaris from a municiple sludge. six of the C. aculeata's spine structures can be seen in part in this image. The color of these specimens is the result of an anaerobic environment with the iron present in the cast converted in part to iron sulfide. The concave vent of A. vulgaris is evident here. Centropyxis aculeata is a rhizopoda of the Order Testacida and Family Difflugiidae. Arcella vulgaris is a rhizopoda of the Order Testacida and Family Arcellidae. these are both very common Thecamoebians. In comparisons between the thecamoebian populations in freshwater lakes the presence of a higher proportion of Centopyxis aculeata may indicate a more brackish condition. Centropyxis aculeata is oval with 4-6 spines distal from the vent. It may be translucent to opaque, typically in shades of brown to black. Arcella vulgaris is a circular dome with a concave small central vent underneath. The test has a pattern of hexagons that are each about one micrometer across. Jahn, T. L., HOW TO KNOW THE PROTOZOA, Wm. C. Brown Co. Publ., p. 127, 1949. Scott, DAVID B., FRANCO S. Medioli, and Charles T. Schafer, MONITORING IN COASTAL ENVIRONMENTS USING FORAMINIFERA AND THECAMOEBIAN INDICATORS, Cambridge University Press, p. 112, 2001.